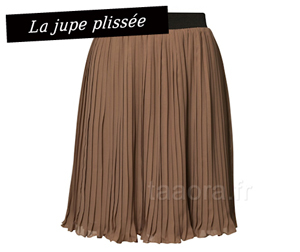 The pleated skirt is undoubtedly one of the biggest trends for summer, brown lined short version here (44 € with free shipping at Zalando), to wear with a basic t-shirt, a blouse or shirt, depending on the desired effect. 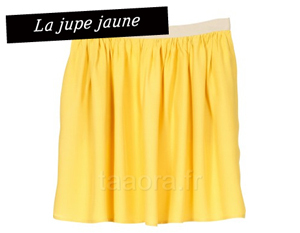 The yellow skirt, strong color of summer. We love this model chick yellow signed that brighten our American Vintage look (60 € at MonShowroom). 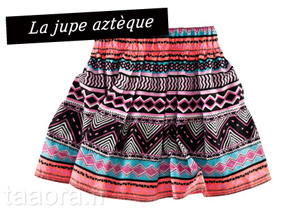 Focus on the Aztec print skirt colored with shopper cheap at H & M (€ 14.95). 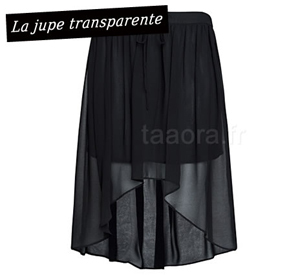 The transparent skirt or rather semi-transparent from mid-thigh, asymmetrically cut, which allows to reveal her legs without revealing too much either (Mango, € 29.99).